This past Saturday I participated in a local 10K race in Thorntown, IN put on by a charity organization, Hope for his Children Inc, that benefits orphaned, abandoned, and impoverished children of the world. Being a foster parent I was drawn to this race for the good work this organization does on behalf of our most vulnerable population, kids. The event gives participants the option to run or walk a 5K or 10K distance for an out and back on a flat and fast section of a reclaimed rails to trails system starting at the Thorntown trail head. The start of the trail is paved and eventual turns to packed gravel. The trail is beautiful as it explores the Indiana countryside and cornfields. I really enjoyed the course and the event overall. The volunteers and event staff were well organized, friendly, and informative exemplifying Hoosier hospitality. The race coincides with Thorntown’s Turning of the Leaves festival weekend so there’s plenty to do, plenty to see, and plenty to eat after finishing the race! If you want to run a great local race for a good cause then add the Hope on the Trail Run/Walk to your race schedule for 2018. I know I’ll be back next year! 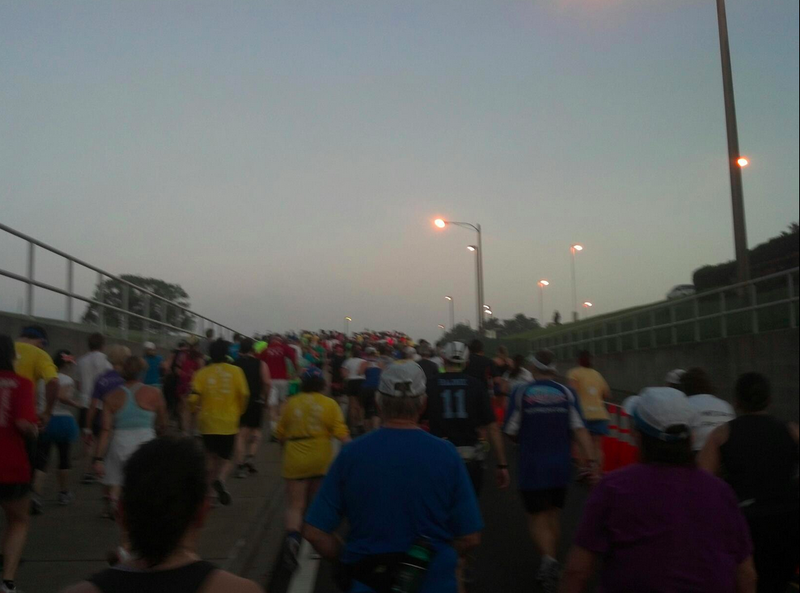 Today was the 3rd annual Purdue University Boilermaker Half Marathon. I signed up for this race last year right after running the soggy 2nd annual Purdue University Boilermaker Half Marathon. Today’s weather was a cool 47 degrees and overcast. If you are unfamiliar with the West Lafayette and Lafayette, IN area that surrounds Purdue University’s campus then let me tell you the course is a bit hilly. The course starts out on the edge of campus near Ross-Aide stadium and heads out toward the Purdue golf courses. The first 5-6 miles are very pleasant with a few rolling hills and even includes a great deal of downhill grade running as you cross down into the Wabash river valley to the Lafayette side. 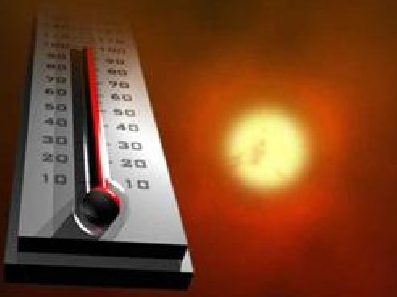 Once into Lafayette you run around the downtown Lafayette area and then begin your trek back to the shores of the Wabash around miles 7-8. It is very picturesque and filled with memories for those returning alumni, like myself, who spent our formative years at our ol’ Purdue. Do you remember me saying a few sentences ago that you were running DOWN into the river valley? Holy hell, you have to get back to campus! Mile 8 to 9-ish is all uphill. You think a bridge would be flat. NOPE! It looked flat from the other side! …optical illusion apparently. Up until then I had been maintaining a nice sub 9-minute pace and feeling great! I was fueling on a strict schedule and running through the water stops without slowing down. I used the crush top cup method to pour water and gatorade down my gullet and kept running never breaking stride and surprisingly getting most of the life giving liquids into me without too much spillage. That “last” hill felt like it went on forever and it took a lot out of me. We climbed and climbed and climbed. I passed many a runner who was brought to a walk, but I had trained for this hill as I run most all my treadmill runs at a 1% incline so I am used to maintaining pace on an incline. By the time I was at the top of the hill I felt like I was moving so slow, but my Garmin was still telling me that I was well below a 10-minute mile pace even though I was over my 9:05 needed to come in under 2-hours. At the top of the climb we made a turn to take us over to the Purdue University hotel and through the heart of campus to head back toward the stadium. Passing the 10-mile marker I remembered where the course goes next and I remembered I was mistaken on that “last” hill comment earlier. The course doubles back on itself to go back by the Purdue golf courses toward the finish line in order to avoid running up that enormously steep hill that is right next to Ross-Aide stadium. In order to accomplish this the course goes up Stadium Avenue to McCormick Road, passed the fraternities near Slater Hill…yes, it’s called Slater hill because well, it’s a big hill…like the kind you can sled down in the winter time…with a couch if done correctly. The good news! It’s not that long of a climb. The bad news! It’s steeper than the bridge I mentioned earlier. This time my Garmin told me that I WAS over the 10-minute pace for a short period. I caught more and more runners as many walked up that hill. 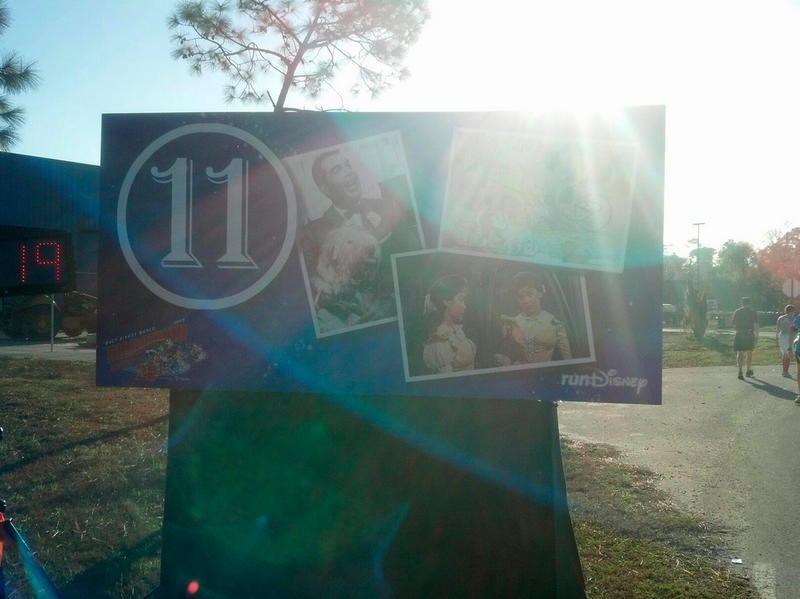 At the top of the hill was the 11-mile marker. I had 2.1 miles to go on relatively flat terrain and I was about 95+ minutes into the race. I realized I could do 10 minute miles the rest of the way and still beat 2-hours! However, I didn’t come here to run 10-minute miles so I pushed it to keep a pace closer to 9:20. 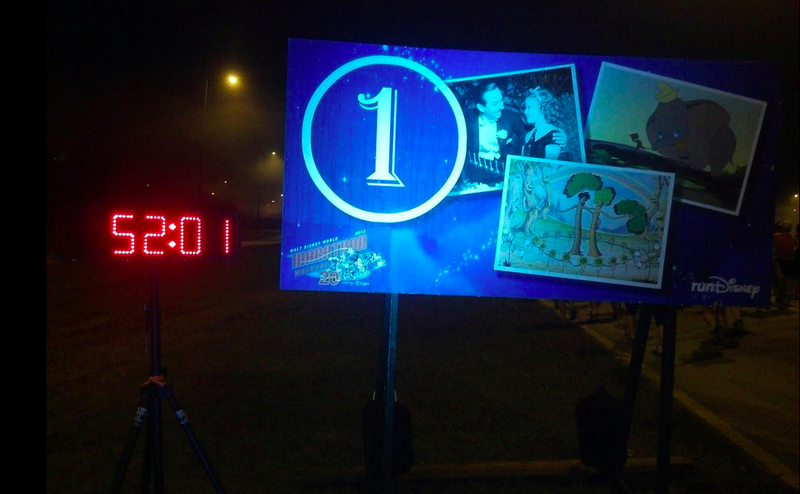 After passing the 12-mile marker I enjoyed the last 1.1 miles. 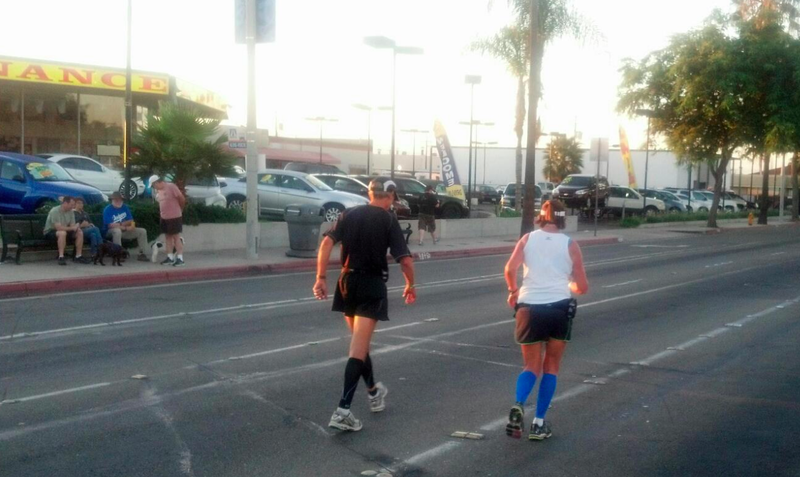 At about a quarter mile out three Fleet Feet guys passed me and I decided to stick with them. They were running an 8:22 pace which felt surprisingly good to me! I cleared passed the three as I sprinted to the finish looking at the clock right as I crossed the line. The clock read 01:57:08. 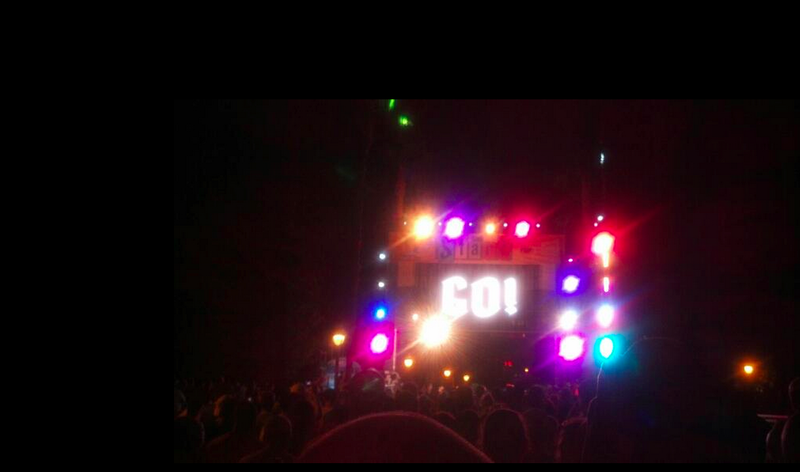 I know a few more seconds will be shaved off since I wasn’t toeing the start line at the gun. Afterwards I was prepared for the smile, but I was unprepared for the emotion as I’ve chased this sub 2-hour goal for a couple years through unbearable heat and more than one very chilly race. Today’s race was perfectly set with a cool temperature, a sun under cloud cover and otherwise dry conditions. 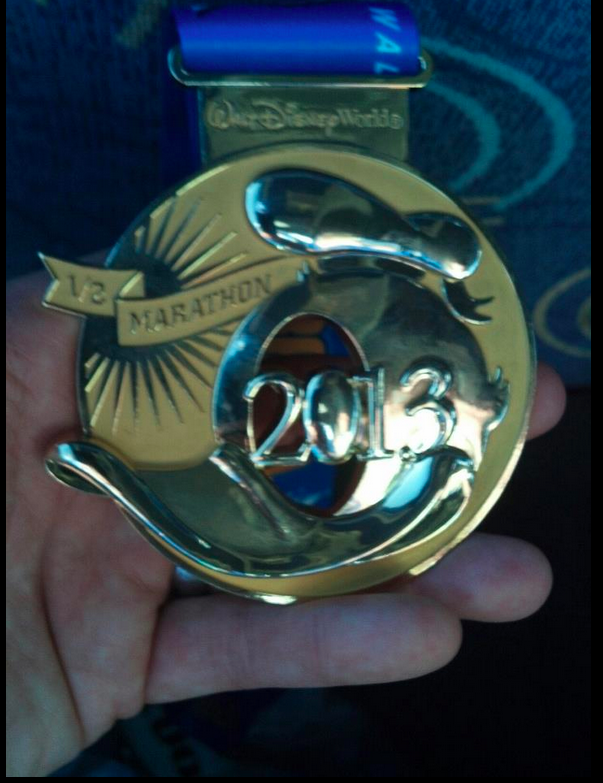 I cannot be happier right now and I’ve already put my new PR medal in it’s place of honor on my PR medal holder! In two weeks I have the Indianapolis Monumental Marathon. 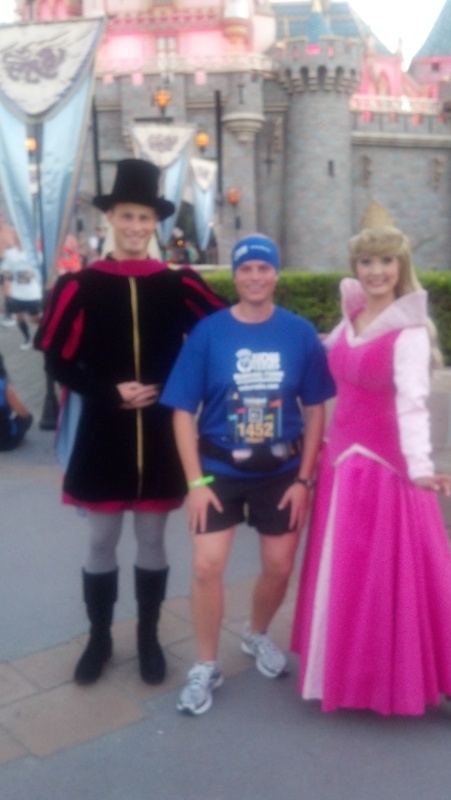 This is a training run for The Dopey Challenge and I am excited to run it! Next weekend I will still do a long run of close to or right at 20 miles. Looking forward to it! I apologize. Wait….what? 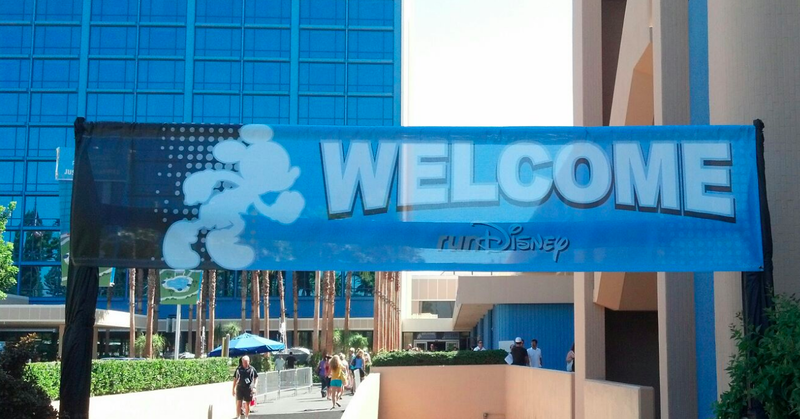 That’s a weird way to start out such a happy post about a weekend of running at the most magical of places! An apology? What gives? Well, I have to apologize for what will be a blog post with nearly a complete lack of pictures. 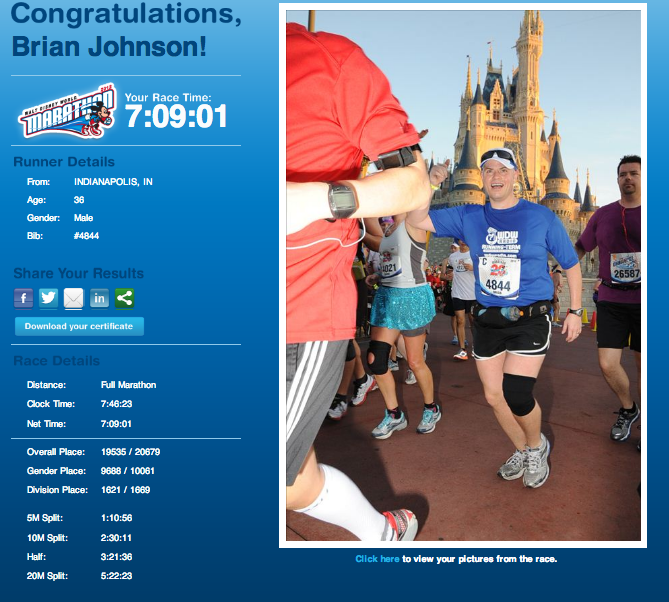 You see, for the first time in four years I decided to not run the Disney marathon “just for fun.” Therefore, I didn’t take a lot of pictures…none actually. Instead, I had my eyes set on a PR (Personal Record for non-running folk). Originally, my friends and I had planned on running a sub 5-hour marathon which would be a PR of ~15 minutes for me. Let me tell you that running for over 26 miles at a pace that is ~30 seconds faster per mile than the last marathon you PR’d is a LOT faster. I knew it was going to be doubly tough because over the last year I managed to gain an extra 20 pounds…my training and focus on nutrition just wasn’t as sharp as in years past. Three of us planned to run it together and use the Galloway Run-Walk-Run method. As the time approached for the race we found out that Mitch had a stress fracture in his foot and would not be able to run with us. Also, the week before the race Matthew came down with a stomach flu, but was still going to give it a go! Joe decided to run with us though he was doing the Dopey Challenge and had turned his ankle during the 10K so we were a sorry lot by the time Sunday came around. 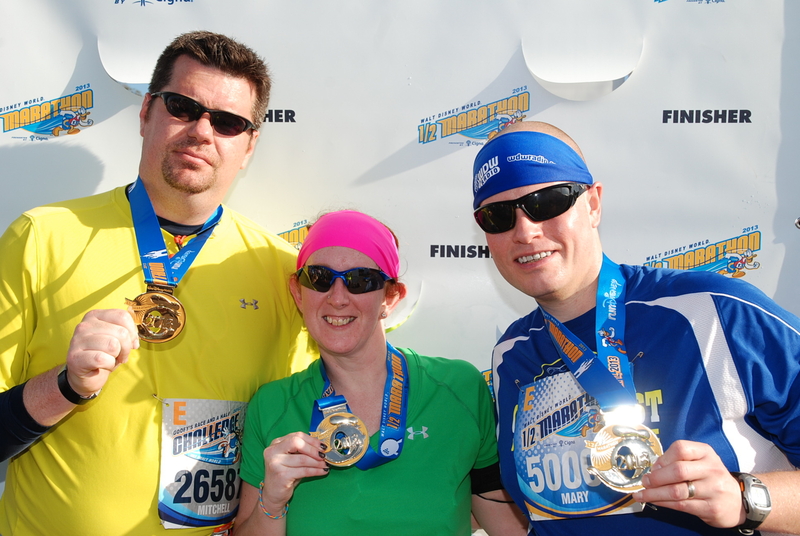 Joe, Matt and myself started the marathon together and it was a laughfest! We went along for over half the race when not too far from DAK Joe had to slow a bit due to the pain in his ankle (he still finished!). Then it didn’t seem too much further down the road Matt had to slow down as well most likely due to a bit of dehydration (he ALSO still finished and PR’d). This left me to run the remaining back half of the race on my own and I just kept moving forward. They say that at some point during a long run that it won’t hurt any more than it currently does…that doesn’t mean it doesn’t hurt like hell just that once it really hurts it probably won’t get any worse. I would like to thank the person who thought that tidbit of insight up and shared it. When Matt and I had been at the 13.1 mile mark we knew that we weren’t going to come in under 5 hours, but that didn’t bother me as my previous PR was 5:15:07 so as long as I PR’d I was happy, but it was a bit disappointing that the initial goal was already out of reach. At the 20 mile marker running solo I was not a happy camper. 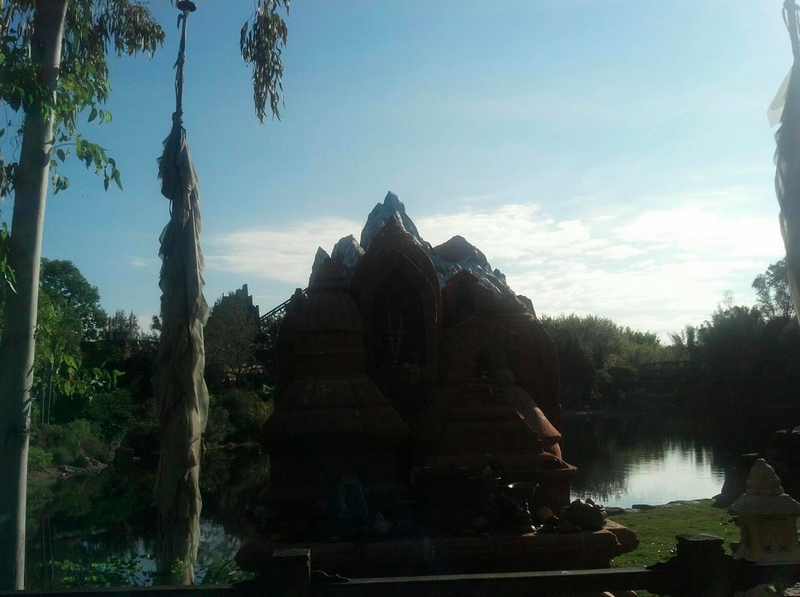 My feet hurt like hades and I was looking forward to a trip around the world showcase. It was then that I really appreciated the volunteers and the spectators. It’s not difficult to see the look of pain on a runner’s face as they go by plus if a runner is taking 5 hours then most likely they have long since passed the enjoyment phase of the marathon until they see the finish line. One spectator called out to me by name to keep going and that I was getting close. Another couldn’t see my name on the bib, but instead called out my team name (Team DAWS). Again and again the crowd was yelling out to individual runners! I was amazed at the sheer number of spectators yelling to the runners. I’ve ran a lot of races and have observed this before, but never so many. 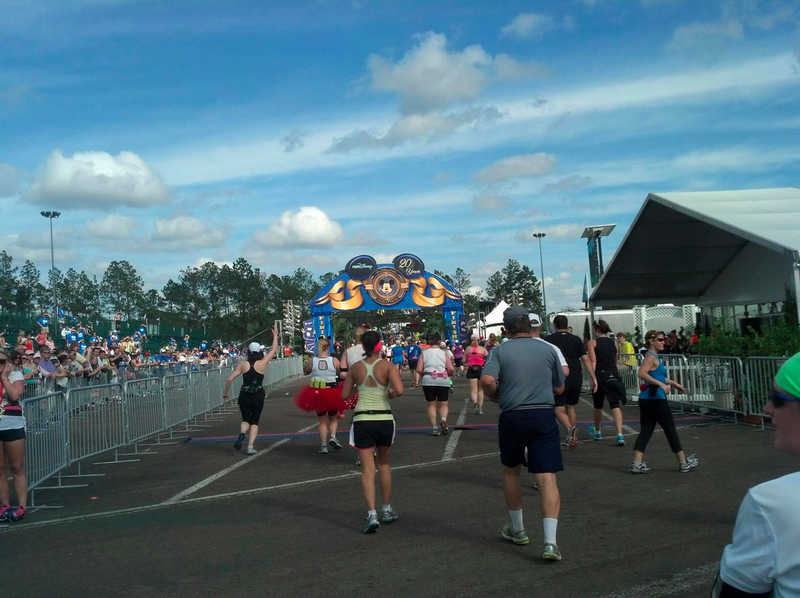 By the time I reached the Disney Hollywood Studios I knew I was still on track to PR by over 10 minutes which is a great accomplishment considering I was carrying the extra weight. 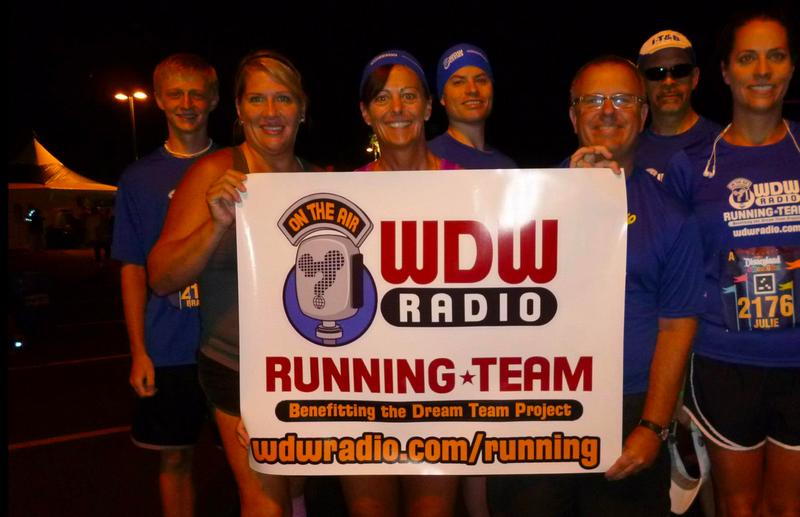 I knew members of Team DAWS & the WDW Radio Running Team would be waiting just inside EPCOT and I really needed the boost of energy from seeing my fellow team members and running family. 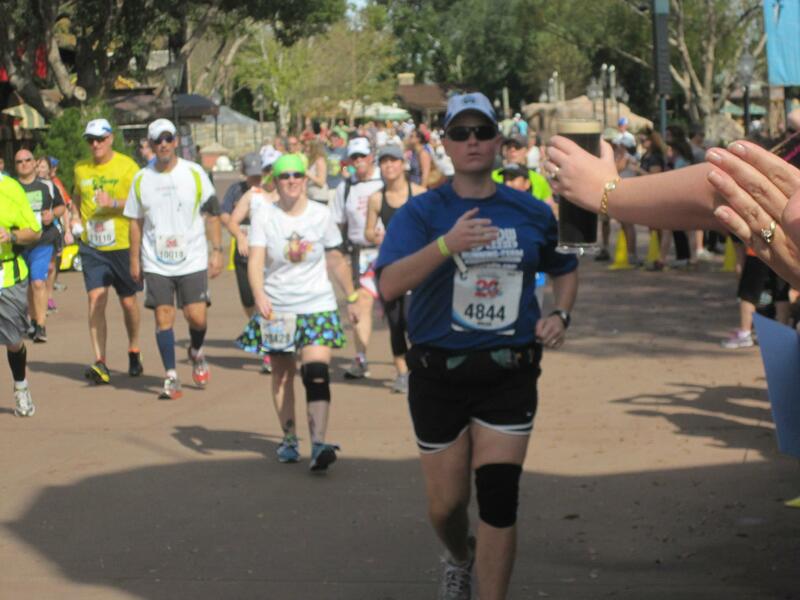 As I came into EPCOT I saw everyone and my face broke out into a big smile that stayed with me for the last mile plus of the race. 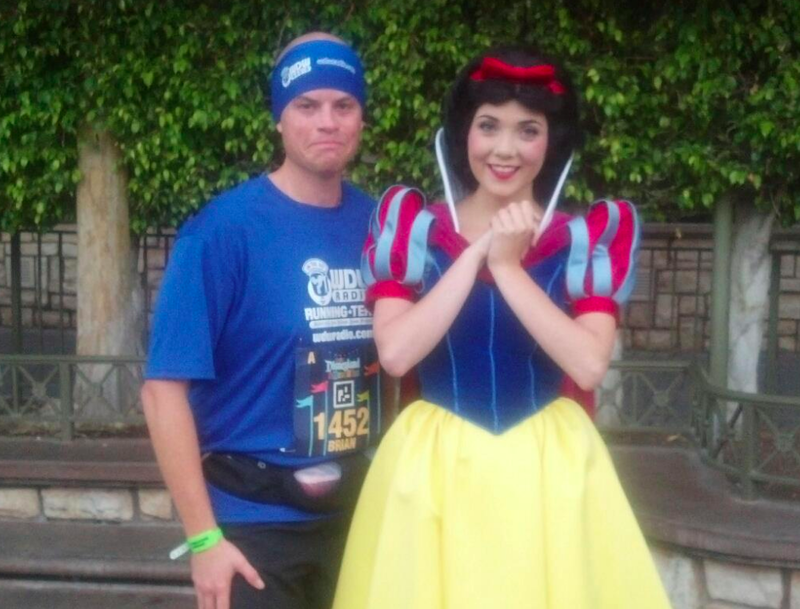 I hadn’t smiled that big since I had finished my first marathon on this same course four years ago. After crossing the finish line I knew that two of my friends were volunteers assigned to hand out medals so I hung back until I found Beth and Mike. It was extra special to have them give me my medal! 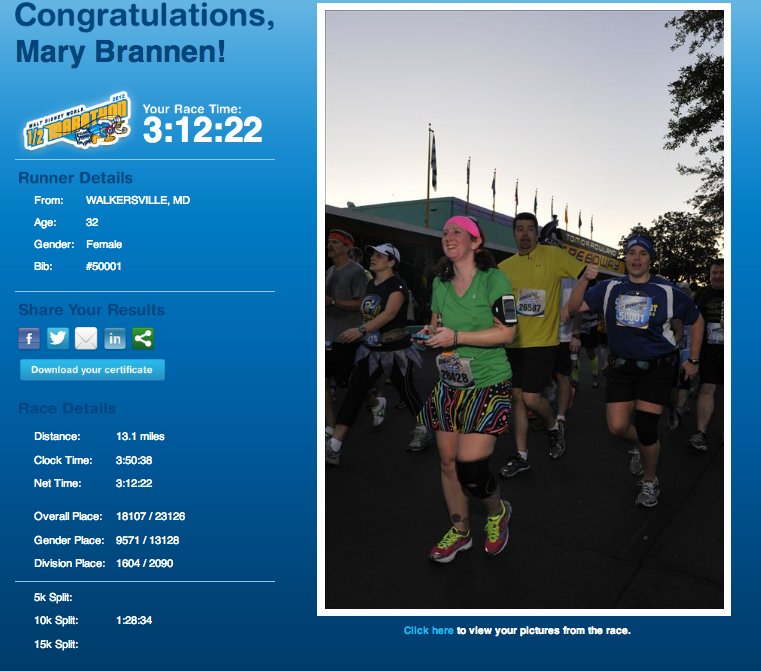 A PR for marathon #8! 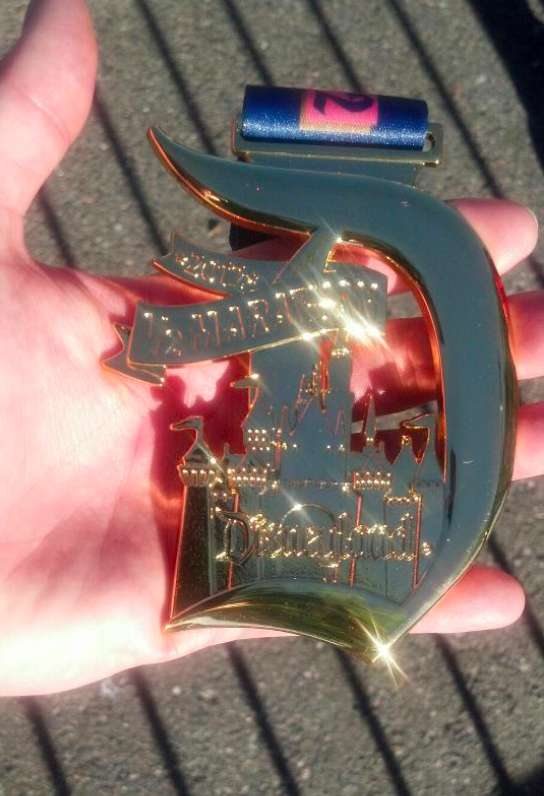 In the end I found that I had improved my PR for a marathon by 10 minutes and 25 seconds and this was also my best course time for the Disney marathon by over 26 minutes! It was time to celebrate with my running family so I headed to the buses to go back to the resort, get cleaned up and head back to EPCOT to start the celebration! 2014 promises to be a big year as I train for my first 70.3 triathlon, my first ultramarathon, and the Dopey Challenge for January 2015! Be sure to checkout my Facebook page for weekly motivation and running tips at Facebook.com/RunningDownsDream23! Whenever I run a marathon I begin to think of all the motivational quotes that have inspired me. Beer Run•ner (noun): 1. Someone equally devoted to fine beer appreciation and an active, healthy lifestyle. After psyching myself up a bit I’m ready. 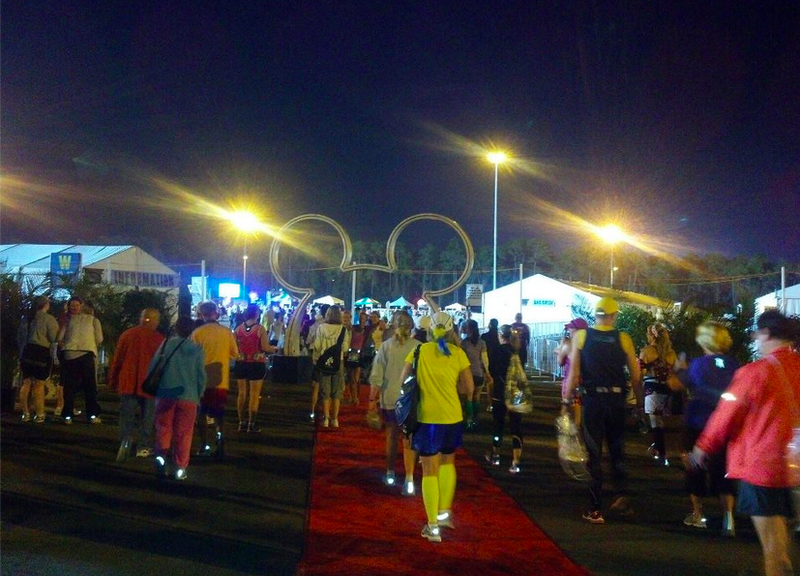 I always set up my marathon gear the night before and for Disney races this time is especially important since once you leave your resort the possibility of getting back should you forget something is nearly impossible. 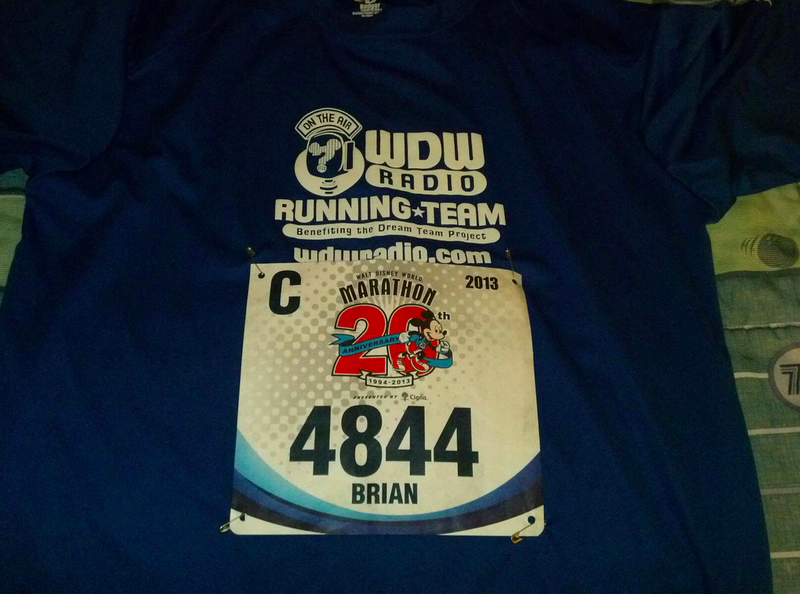 Bib pinned on the night before! Ready to go! 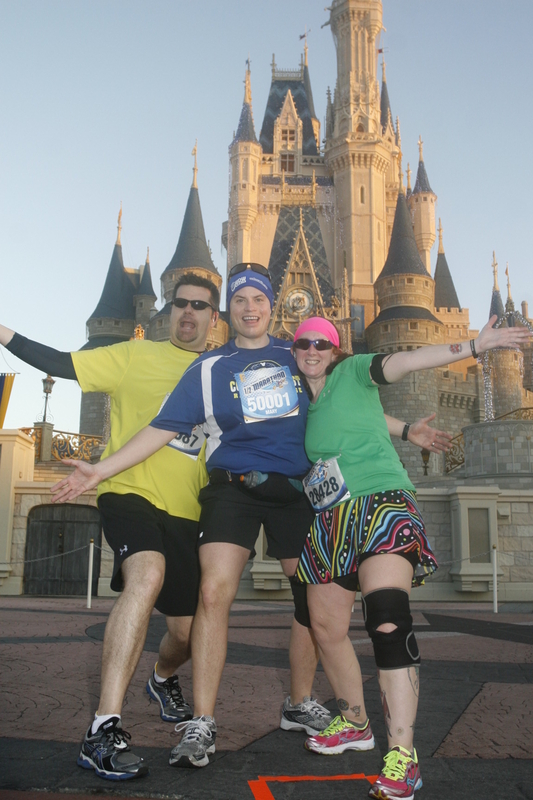 Getting to see and run with friends is one of the best parts of Disney Marathon Weekend. The marathon was a mental battle. The lessened training due to illness along with the half marathon the day before made this race one of the toughest (read painful) races that I have ever run. In addition to being one of the most painful races I have ever run it was also one of the most fun and exciting races that I have ever run. I pushed myself to the mental edge and persevered. Now, with that being said let me show you how much fun the race really was! 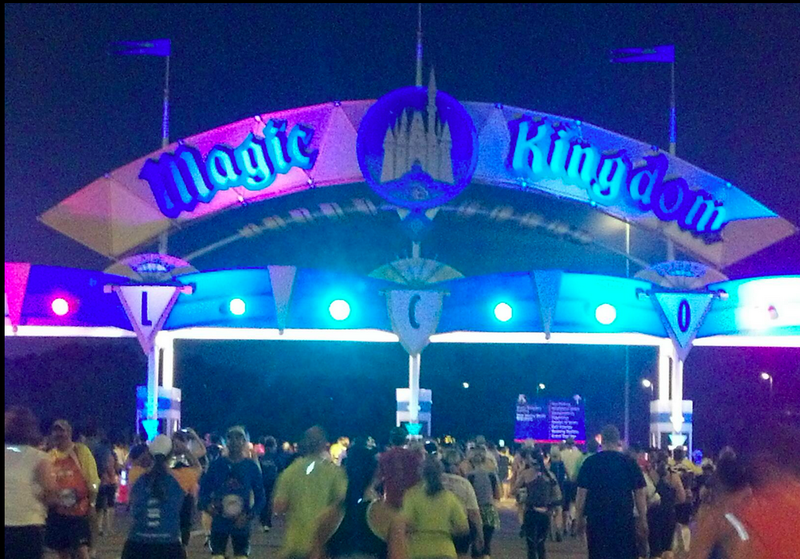 The best part about the race as you might imagine is running through all of the parks! The only hill besides the on and off ramps is “Contemporary Hill”. 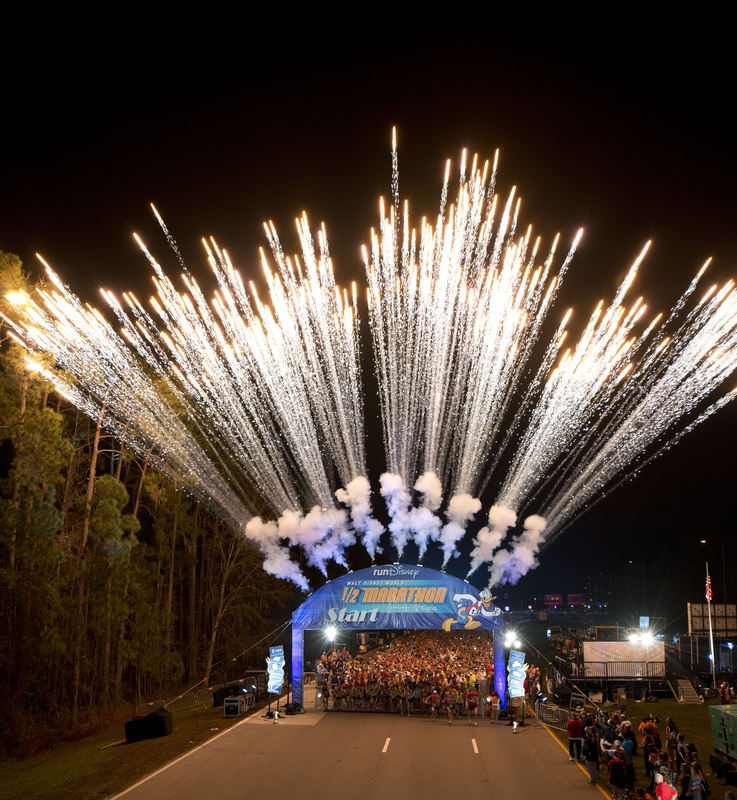 Chances are unless you’ve stayed at the Contemporary Resort or ran a Disney World race you don’t know about this “little hill” which brings many runners to a walking pace. The picture may not do it justice but the grade is significant. 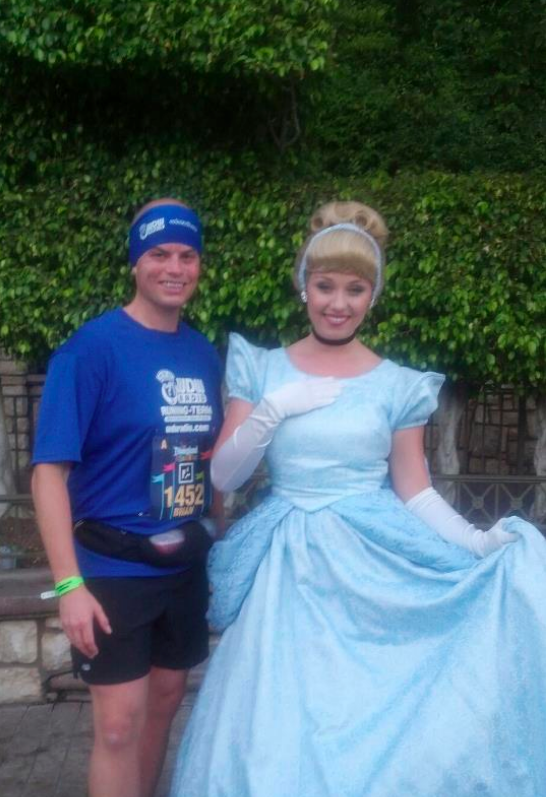 The next best thing to running through the parks is all of the characters you see along the way! I was surprised at how fact the first 11 miles went by! 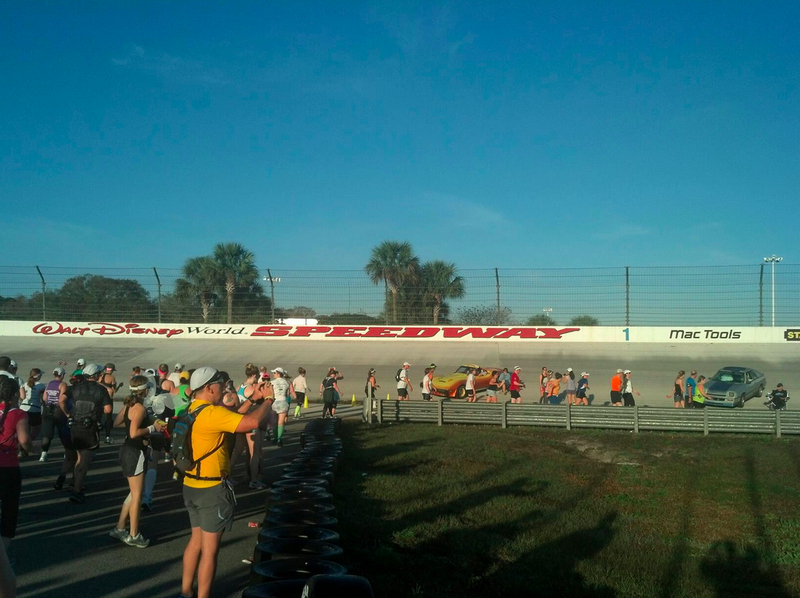 The new course for the marathon allowed us to run around the Disney World Motor Speedway. This was the first time I had seen the inside of the track! 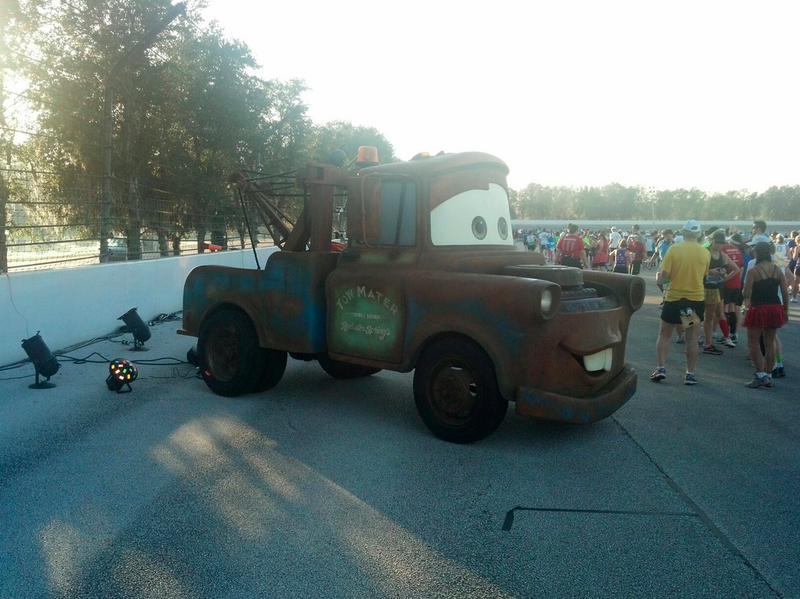 And the Cars characters were out in force! 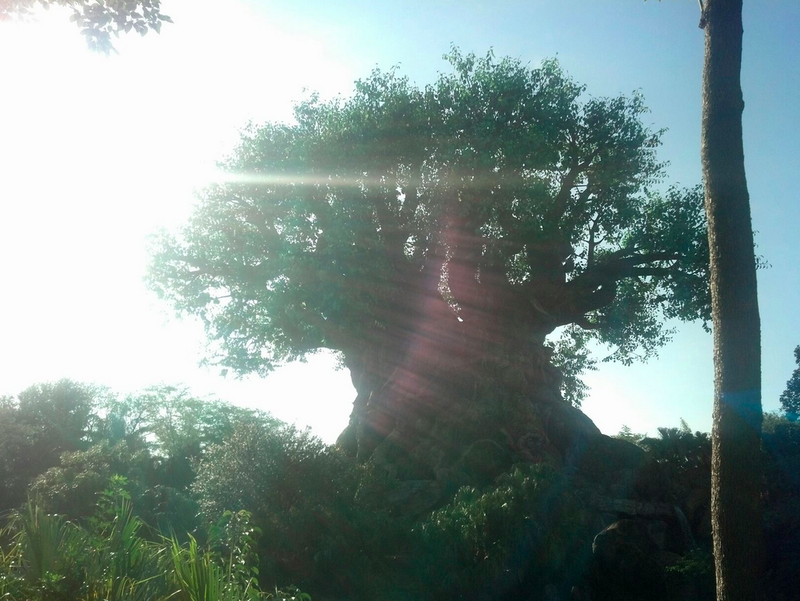 Running through Animal Kingdom is always awesome! 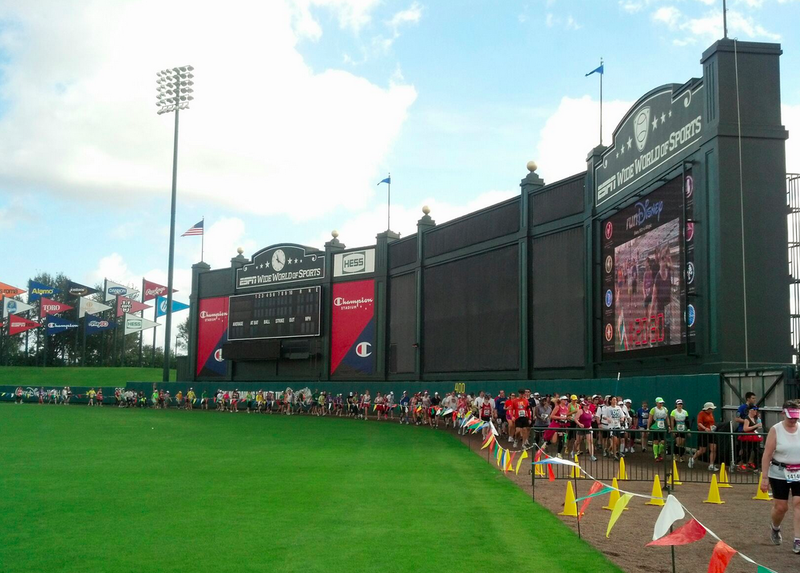 Another change in the marathon course this year was getting to run through the Wide World of Sports including where the Braves conduct spring training! 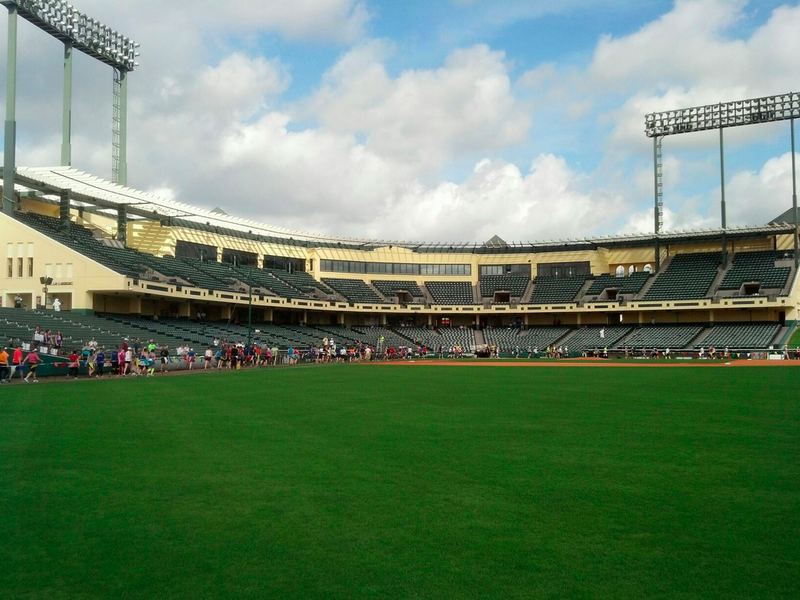 The stadium was fun to run through and soon enough we had rounded the bases and were off! This whole running the infield made me want a hotdog from Casey’s! 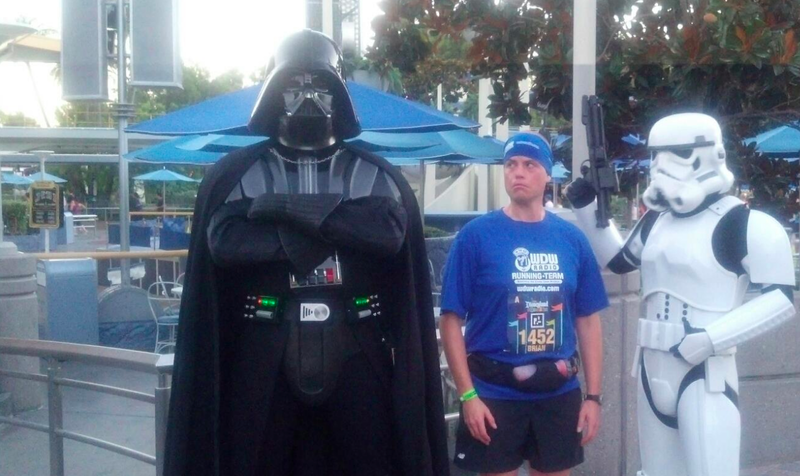 I don’t have any pictures from the Disney Hollywood studios as I was in a lot of pain by this time in the race. 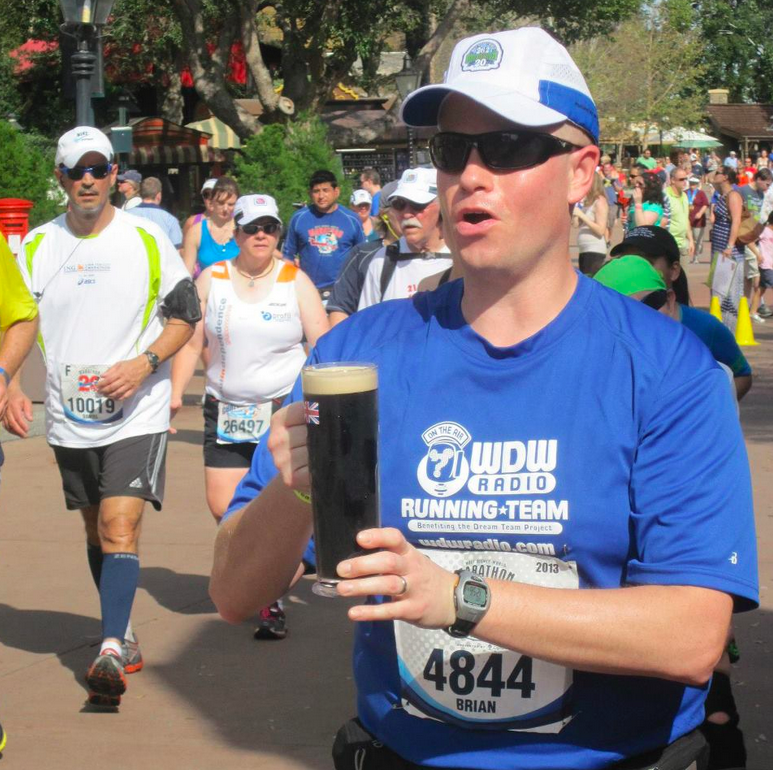 The next thing I knew we were entering EPCOT where we had phoned in our order to the Rose & Crown for some adult libations! Guinness never tasted so good! Notice all the people behind me who REALLY want my beer! See if you can find all three! A short mile later we were approaching the finish line! 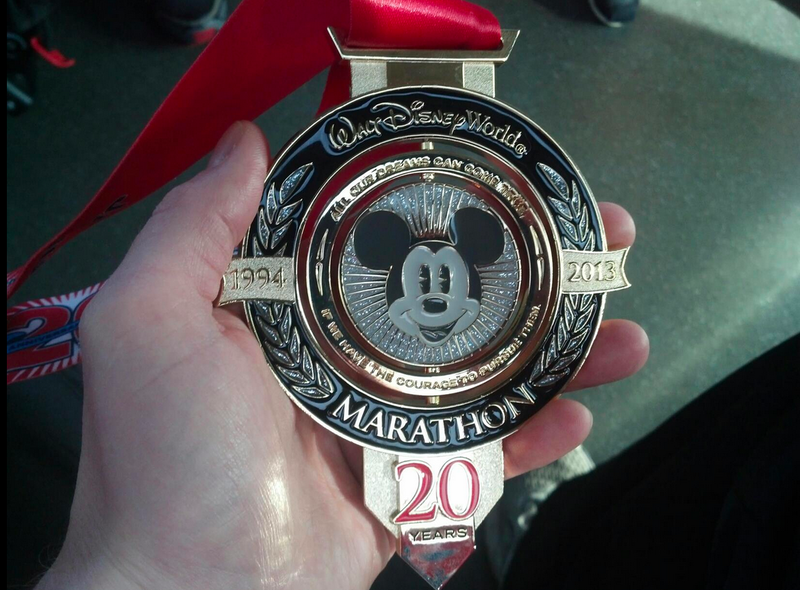 Then finally, the 20th anniversary Disney marathon medal was mine! Added this to my collection! Two days and two medals! Not my fastest time, but great training for my upcoming ultra marathon in June! 11:36:01 on my feet across two days. 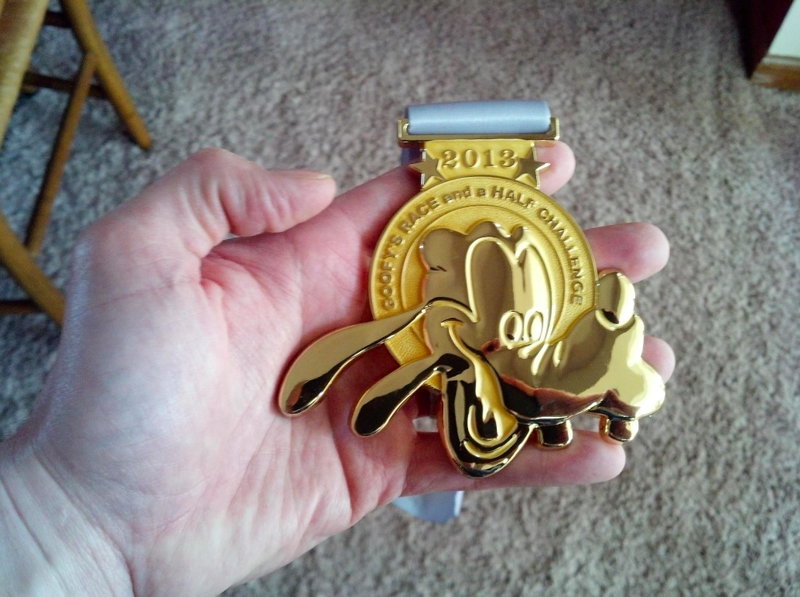 Thanks to eBay I did find myself an UNofficial Goofy medal. 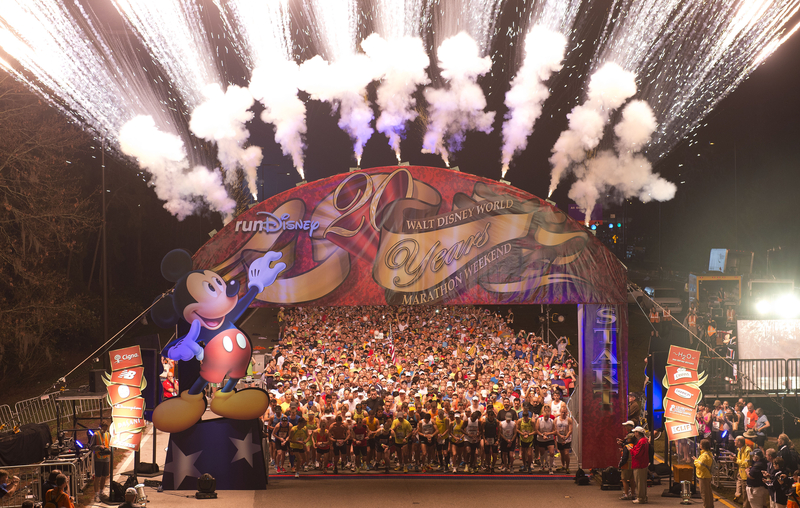 It’s unofficial because Disney didn’t get their extra registration fee, but I’m sure the running community at large would be okay with it since it’s the 39.3 miles, not the $300+ registration fee that make a runner Goofy. 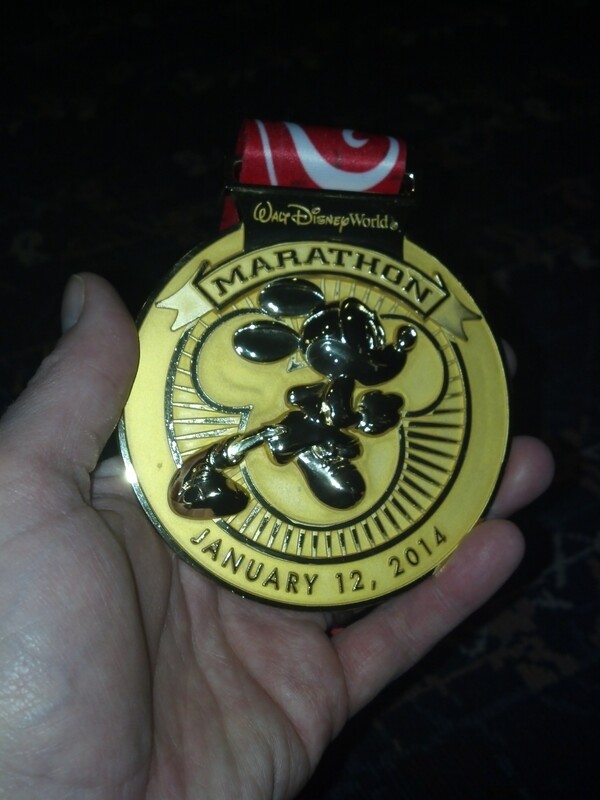 I did the miles (painfully so) so I earned the bling! All my fellow running friends agree with me! Remember, you can follow me @TheRunningMan23 on Twitter! 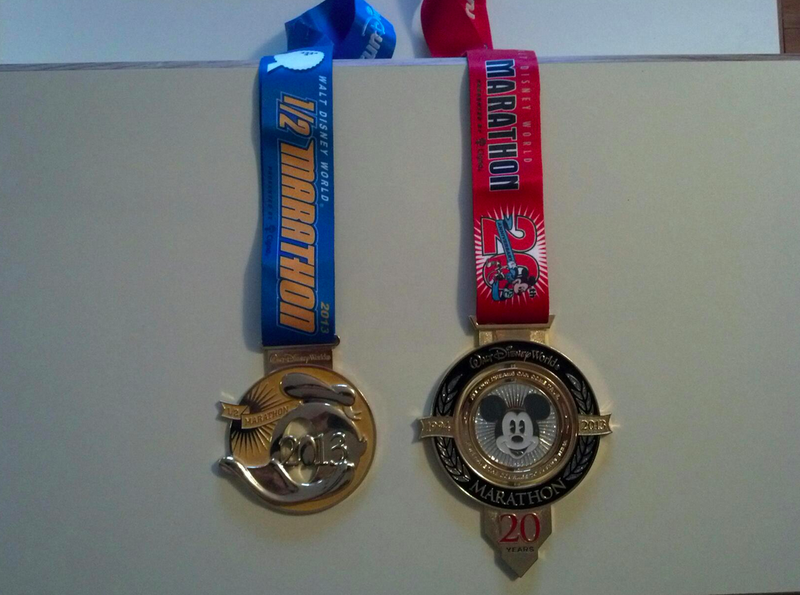 In January I ran the Goofy Challenge to become eligible for the runDisney Coast-2-Coast medal should I decide to venture out to Disneyland for a half marathon in the same year. 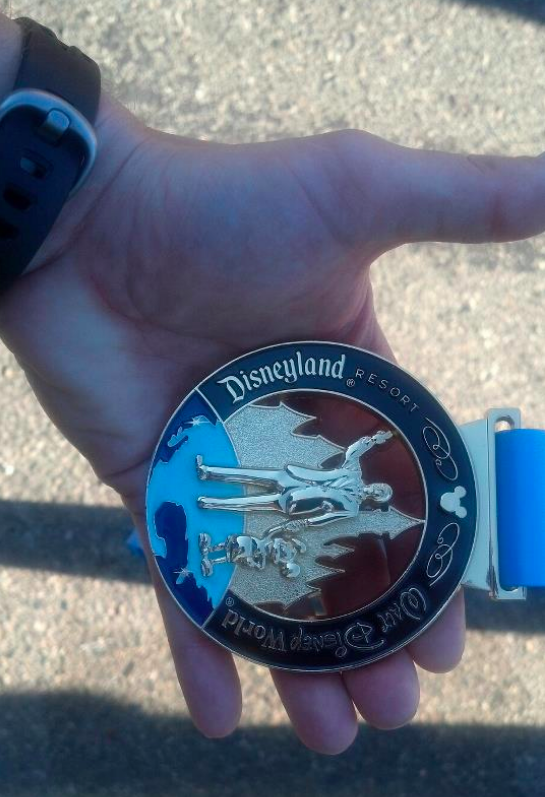 Over Labor Day weekend I took the pilgrimage to Walt’s original playground to bring home double bling. Kate and I arrived on Saturday, grabbed a rental car at LAX and drove straight to Disneyland for the Expo and to get my bib. 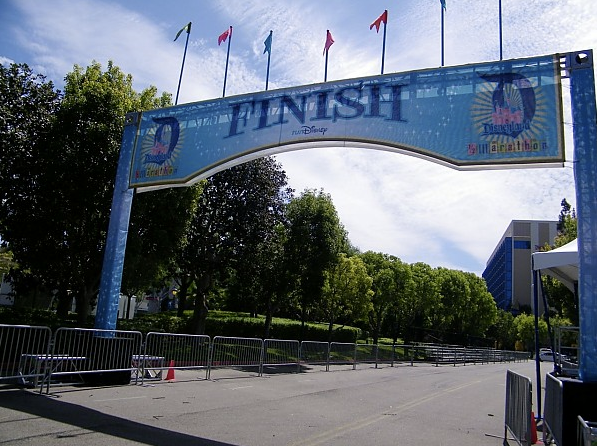 The Disneyland Half Marathon being a smaller race than its East coast big brother has the bib numbers spread across the available corrals A – G with seeded runners in each corral. 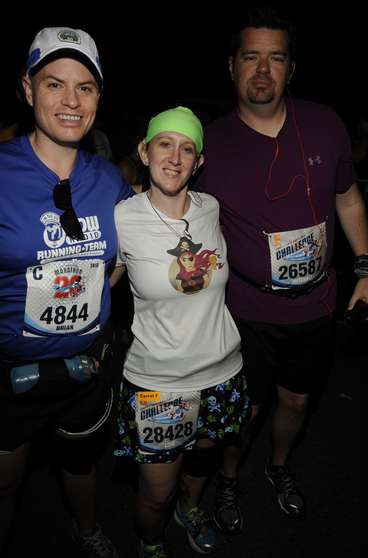 Before the race I met up with some of my fellow WDW Radio Running Team members! I’m in the back with the blue headband. I started in corral A and since I hadn’t done any speed work for a couple weeks decided to hang with the 1:40 pacer until I got to the first photo opp. Know that I am not that speedy so it was an intense first couple miles! Over the next 13.1 miles I took a lot of pictures, chatted with other runners and even ran a few miles with Jeff Galloway and his wife Barbara who were just coming off a race out in Alaska so they were taking it easy. 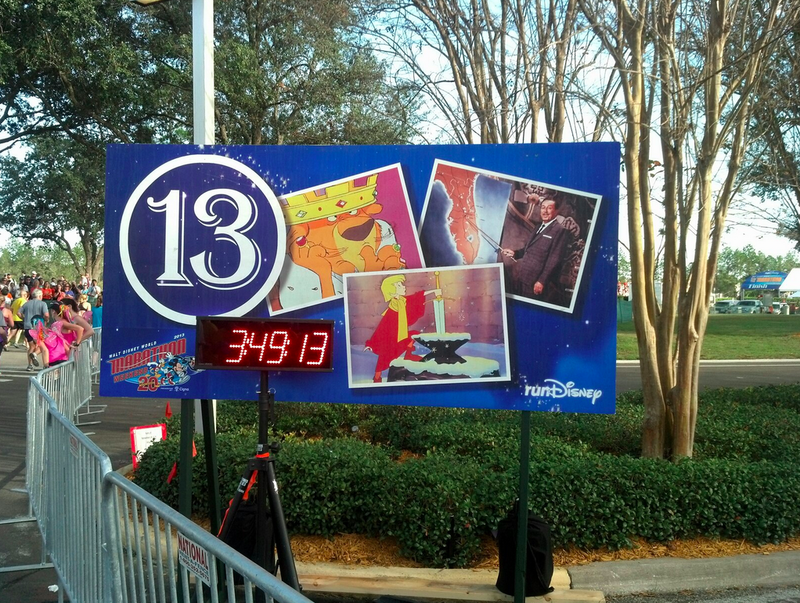 Now most people know to not go out too fast for a race…..but since I really just wanted to run 13.1 miles, take a bunch of pictures, have a lot of fun, and grab double bling…and not take TOO long to start my vacation…I took off like Scrooge McDuck chasing a penny rolling down the street! After all, the ESPN zone awaited with beer and food. 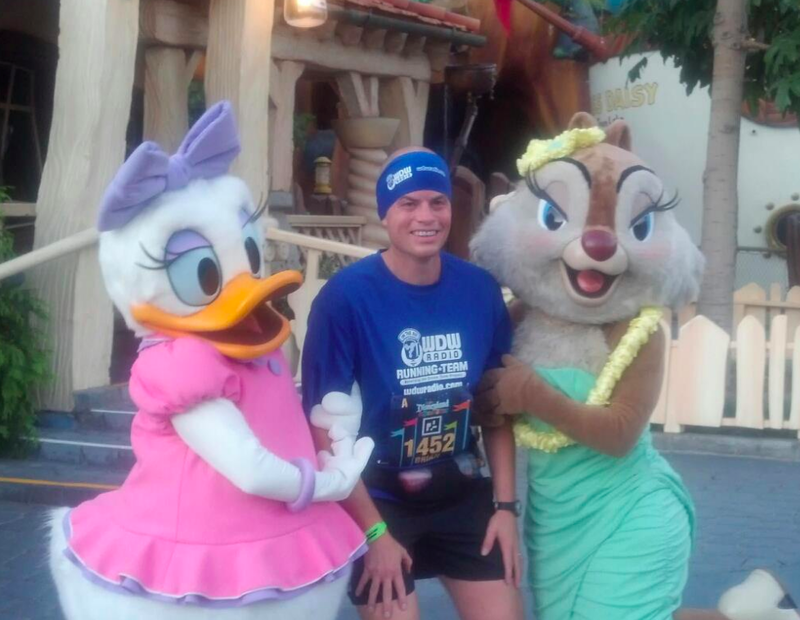 So after a 2+ mile sprint I started taking my time to meet some of the Disneyland ladies! Don’t worry, my wife doesn’t mind as long as I get good pictures! 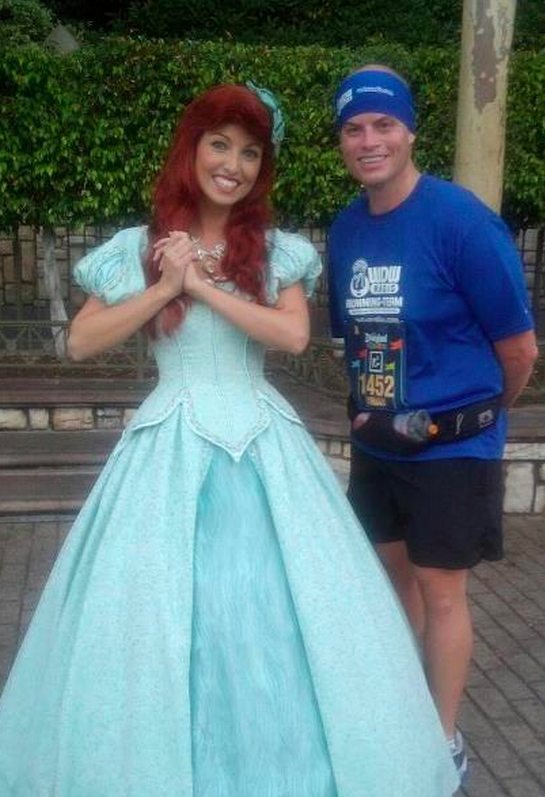 First I met Ariel and we had a blast! I didn’t check for flippers. Next I met this chic. She had to lean on me a bit since she only had one shoe! Not too far down the road was this lovely lady. She kept talking about her seven roommates…weird. Then I ran into this beauty, but she kept falling asleep on me! My fellow runners will tell you that I’m not THAT boring so I assume mild narcolepsy. I think the camera guy even nodded off hence the fuzzy pic. Finally I found these two hanging around outside the Acorn Club. 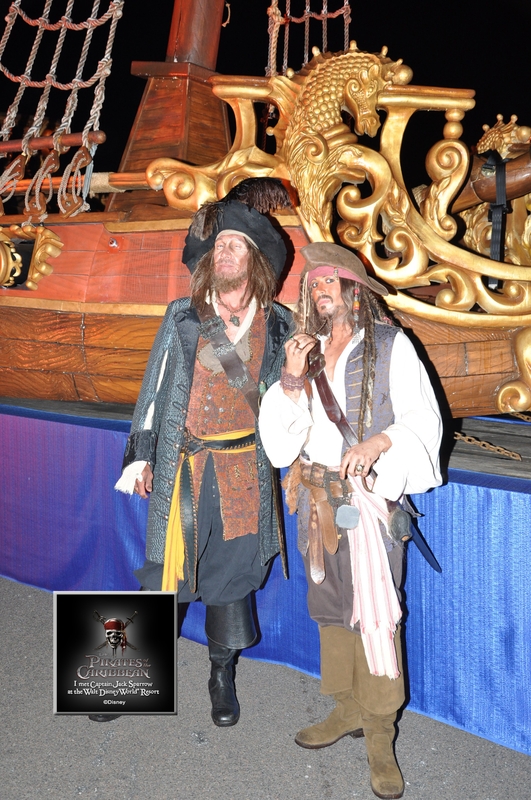 Past the pleasant company of royalty and club dancers I ran into some rough looking characters. I was afraid they’d send me to Detention Block AA-23 so I moved along quickly. 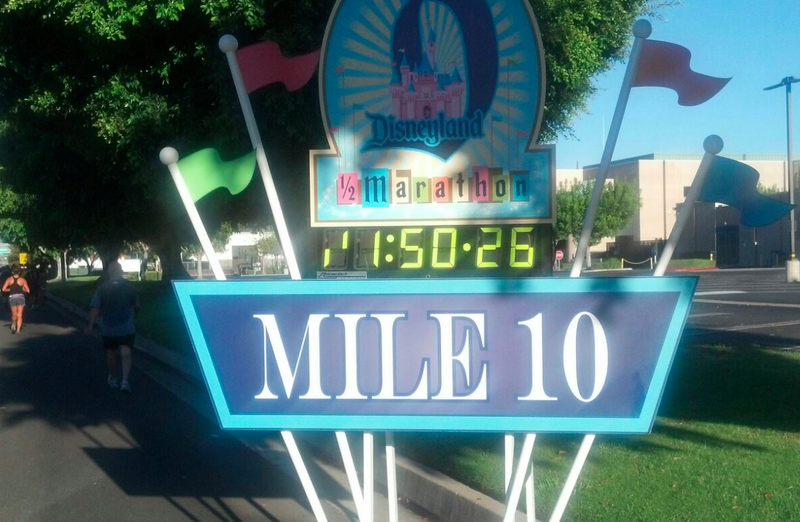 Once outside the Disneyland parks I was left to my own thoughts for several miles as I ran through Anaheim making my way to Angels stadium. Before I reached the stadium I ran into Jeff Galloway and his wife Barbara. 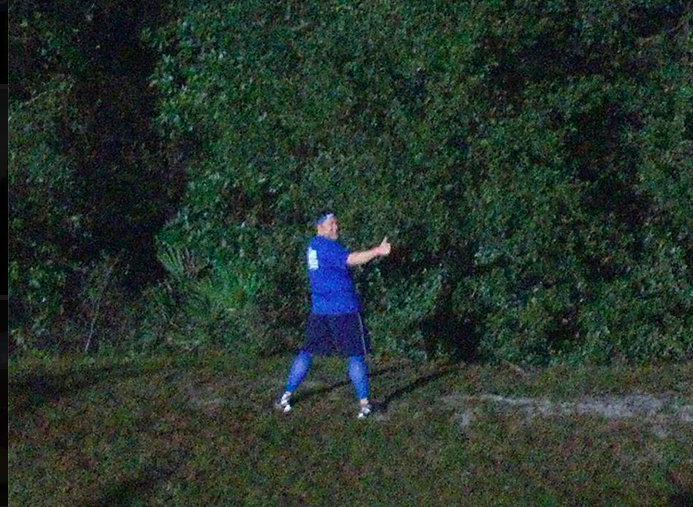 The team was not at home so we were able to run on clay dirt around the edge of the field. It was a great experience to be in the major league stadium. The seats were filled with screaming fans which made it all the more memorable! 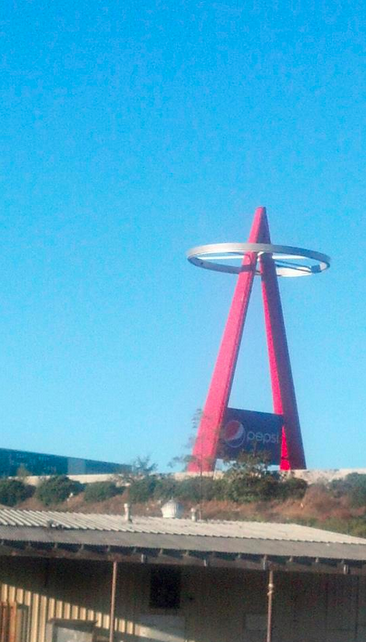 After Angel’s stadium (I have a great video on my timeline if we are Facebook friends!) I was in the home stretch and ready for some treats at the ESPN Zone in Downtown Disney! Only a 5K to go! Before I knew it I was thinking of the Finish Line and my double bling! Soon I would cross the finish line and claim my double bling! And then it was all over and I was headed to find my wife! But before I found my Kate I had a couple things to pick up. Bling #1 – The Big D never looked so good! Then a short walk to the right and I could see what I’d been hoping to earn for months, The Coast-to-Coast Challenge Medal!! Next I met a few WDW Radio Running Team members at the ESPN Zone in Downtown Disney, had lunch and started having fun in DCA shortly after! That night we had another meet-up at the Wine and Country Trattoria with special seating to see the World of Color show that night! Overall, this was a fantastic experience! 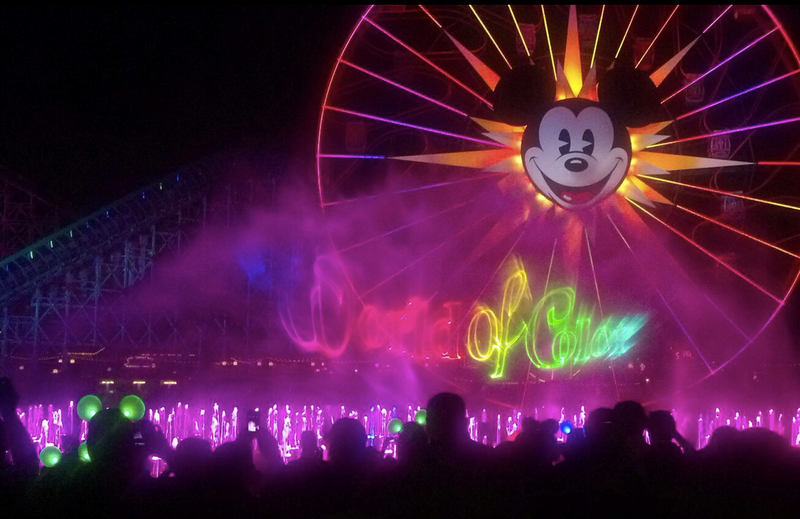 The World of Color show is a Must See!! My next challenge is November 3rd when I’ll be running my first 50 mile ultra marathon! Wish me luck!